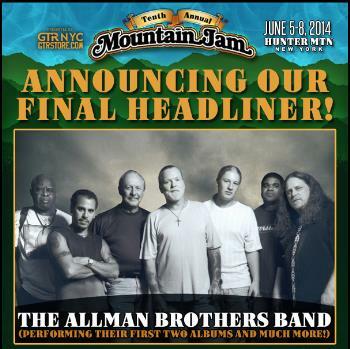 The Allman Brothers Band has been added to the already solid lineup for the 2014 edition of Mountain Jam, the annual festival staged at the base of Hunter Mountain in the Hudson Valley of New York. The full band joins a roster that already included two of its members in their own groups; Derek Trucks will also appear with his wife in the Tedeschi Trucks Band and Warren Haynes, who has helped organize the festival in recent years, will play with both the ABB and his other outfit, Gov't Mule. Sets the Allmans plan to do will include the seminal Southern Rock institution's first two albums in their entirety. Other artists on the 40+ act bill for the June 5-8 festival include Bob Weir & Ratdog,the Avett Brothers, Michael Franti & Spearhead, the Chris Robinson Brotherhood, Damian Marley, Umprey's McGee, Robert Randolph & The Family Band and the Dark Star Orchestra.